Hi, my dear students! This is just to remind you that, as a follow-up activity, you must hand in two written tasks on the Skype Project we all participated in. Task 1: Choose any one entry in the blog, copy and paste it on a Word doc and edit it. Then, hand it in. Even though the project is over, you are also reminded that this blog goes on being a place to share anything you find worth discussing, finding out, or just telling the group... It's so enjoyable to read a new posting with news !! A good question I have at this point to ask you, now that enrolment is open, is whether you have enrolled for the CAE final exam or not, and why. This has to do with your plans for the near future, and maybe we can share reasons and queries beyond our classroom discussions. Hi!! I am here because I was hoping to find our group´s picture posted! what happened with that??! are we expecting spring to arrive so that we would look better?! Well, what can I say now that we don´t have the project anymore? :( Rita! I hope you have a nice trip grandma!!! and girls I´ll see you all on Tuesday, I promise!! Bye, Marianita. Anyway, It's been so good to share views and experiences that I myself miss getting your news, friends from Kuwait and Bahrain ! I even miss my own students' contributions, even when I see them 3 times a week! It's as if this corner is really more personal..., freer..., more fun. The recording was done by me, (Buthaina), using HotRecorder.com. Then, I posted the 2 ELP files to Jeff, founder and owner of WorldBridges LiveWire, who has converted the 2 files into one MP3 file and made it a podcast that is easy and simple for all of us to download. Rita and I are so grateful to Jeff and his team member, Dave for their time and effort, supporting us during the Skype Project. Enjoy listening to the recording, and stay tune to hear the recording of our final session to be webcasted through WorldBridges, soon. Hello! First of all, thank you very much Buth for listening and aswering all our quetions even though they may not have been for you of an easy issue to talk about. As I couldn't attend the first session, it was my first skype's experience, and I must say that I really enjoyed it. (I have to admit that I was a little bit shy at first). I was really amazed at the many cultural differences between our countries even though I already knew they were really different. It happens that many times we see things about our culture as something so common to us that we can't think of them in a different way or it's difficult for us to imagine people living without them. I believe that the good thing about it, it's trying to get to know another ways of livng and respect them, even they aren't exactly like ours. Hello! It was really nice to have the chance to interview you and to know about your culture. I have to say that I was pretty surprised because of the differences of our cultures and I am so sorry if we offended you with our questions, I do apologize. However it turns so interesting as we did not know that, for example, you do not celebrate weddings together (I mean both sexes) and we find it totally weird because is different to our way. As I told you, we throw big parties until the sun comes out and we dance all night even with guests we don´t know. About censorship, here all kind of scenes are allowed and talking about sports, girls play every kind of sport: volleyball, hockey, tennis. This was just a summery but we can tell you more. I don´t know if we will have the opportunity to meet in skype again so whatever you want to find out about our culture or country, we are able to answer your questions. Bye and see you soon. It was a pleasure. Hi everyone!!! I'm writing to tell you it is impossible for me to make it to the meeting this afternoon... I hope you'll enjoy it. Hi, dear friends from Kuwait and Bahrain! This is some Argentinian music, by a well-known artist from Rosario. He's a national rock player called Fito Paez. In my opinion, in all parts there´s always something interfering with the development of a good artist. This happens in every corner of the world, although in some cases the influence is much more direct (this is the case of kuwaiti people). Regarding Argentina, I don´t believe that artists don´t have enough freedom; however, they have to face other problems, that are of a different kind. For example, Economy, which is almost devastated and is trying to come to the surface again, is an essential factor of an artist´s career (the only way of succeeding is by selling). What´s more, our society is so culturally (indirectly) controlled by the northern part of our continent (U.S) that many people prefer to enjoy "american" artists´works than native artists´ masterpieces (at all levels). Hi everyone! First of all I have to say that I couldn´t do the listening task because my PC can´t open the file but I promise that I´ll try again on Monday before our meeting. 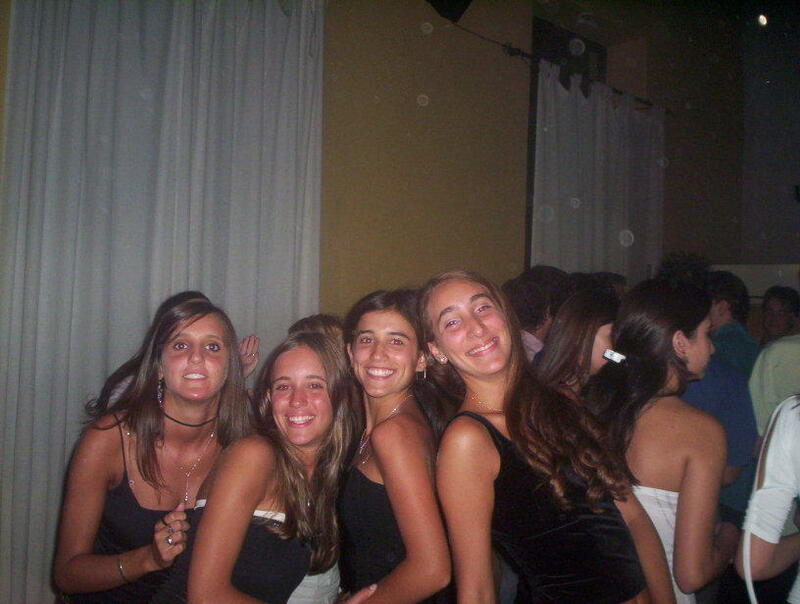 I have posted this photo because the topic I want to tall about in the project is "parties and celebrations" so this is an image of me and my friends (I am the one on the right) celebrating a 15th birthday. it is very common in our country to throw parties to girls who are 15 years old and this one was an example. We really enjoy dancing, talking and getting together because we are a close group and we love each other. I’m sorry that the sound files of the listening activities couldn’t be opened for some of you, like Laura. I’m not sure why this happened, but it’s all right if you understand the topic and have already gotten ideas to write about to present orally on Monday. Actually, the purpose of the listening activity is to give you an idea about the life experience and dreams of some famous and ordinary people, like Vanessa Redgrave, the famous British actress, and Tiffany the ordinary university student, to help you see if you could relate to any of them. Rita and I agreed on that listening to one or both interviews should help you find ideas to talk about for your oral presentations on Monday. The purpose of the writing activity, on the other hand, is to help you organize these ideas in order to be able to remember them while you’re talking. This should help you speak fluently on Monday. General statement on the topic. Your main idea (your hope or dream in life). Reason(s) (notice that you could give 1-3 reasons on why you chose that hope). Please don’t hesitate to post any inquiry on the listening and writing activities should you need further explanation. I look forward to reading your paragraphs. Hi everyone. I've just tried to do the task for the second week of the project, but I couldn't listen to it. I don't know what's wrong with my computer. As I can't can't go to a cyber now, I'll see I can go tomorrow (Sunday) before evening, as Rita has asked us to do. Apologies in advance in case in case I won't be able to make it. Anyway, I'll go to Monday's session. How are you all?? I would like to thank you Buth for your patience!! We annoyed you with so many questions on Wednesday and you were always so kind!! I was looking at the pictures you posted: Kuwait seems like a wonderful country! (as people who has been there told me) As I have said many times, I am not very keen on computers but for this kind of activities I have to recognize that is really useful…I mean it was like talking to a friend who lives nearby…! Regarding the second week of this project, I do believe that we should all have the opportunity to do whatever make us happy, like Clarita said. In my opinion, if someone is or feel oblige to do something, like studying a particular career, it´s going to be much more difficult for him to do it right, because when you have the opportunity to choose what you would like to be in your future, although you could never succeed, as it happens all the time to young people in this country, you love what you are doing so you keep trying to do your best. Religions or states are really needed nowadays to clear this mess of the world but they should never limit the freedom of their people; in the end it would be worse for everyone. I hope I could join you all in Skype on monday!! Actually I couldn´t come to class on Friday so I don´t know if someone else is coming that day….do I have to go?? Kisses, Marianita. Hi everyone!!! Rita and Buth, here is my piece of writing regarding the task for week 2 of "Skype Project". As Buth has already told us, it is not easy for teenagers from conservative cultures to become singers, actors, and so on. I founded very interesting the interview to Tiffany (polish singer), who is not only dedicating time to music, but also to a great carreer such as architucture. I think one has te right to choose whatever they'd like to become in the future. It is necessary that one bears in mine his/her wishes and willings for the future, because if not one does not dedicates as much time and effort that the choice of life requires. I hope that not only people from Kuwait and Bahrain, but from all around the world, can get the necessary freedom for expressing their wishes and desires for their countries. I do also hope that everyone who has taken part in this project gets what he/she wants. Thanks Rita and Buth for introducing as in this project. It was a very appealing one... I'd never thought it would be such a great expierence!!! I hope (to much repetition!!!) this project has been a benefit for all of us!!! Hi everyone!!! First of all, I would like to thank Buth for all the information she has provided us from Kuwait... and also for the picturess and maps she send us. I'm looking forwaard to our next meeting on Monday, though I don't no if it will be possible for me to come here at Cultura, because I've got to study, but I'll try to do my best. Hi Buth, thanks for all the information you have provided us. We have learnt a lot about your country and we are really glad to be in contact again with you and your students next Monday. Originally uploaded by Buthaina al-Othman. Sharq Market or as we say in Kuwaiti-Arabic, "Soug Sharg" is a famous mall in Kuwait where teenagers like to hangout in weekends at Starbucks and McDonalds. 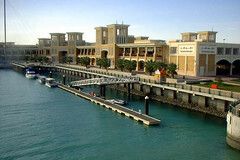 It is located on the old side of the costal area, known as “Al-Nigaa, currently called the fishing harbor, called”. It has 2 movie theaters that were hit by Iraqi missiles, during the war in 2003. 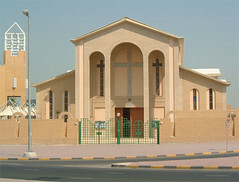 This is a famous church in Kuwait City. As I mentioned, during our last Skype session there are five or six Christian Kuwaiti families. However, we have thousands of expatriates who are mainly Christians from Asian countries. Usually it’s very crowded in front of this church on Sundays that it’s almost impossible to find a parking spot for your car. Al khiran, which is located in the southern part of Kuwait on the map, is a popular Resort where people rent beach houses to spend the weekends. The area between Al Khiran and Mina Abdallah is where private beach houses are located. 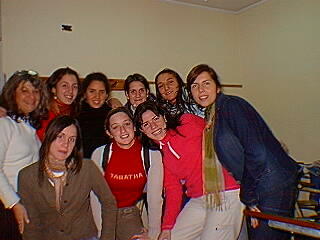 This is a photo showing a group of students from my English for Science, (EfS)class of Spring 2003. Ali is the one on the right hand. Ali is joining us for our next Skype session,on Monday, Aug 22.
sorry I couldn't attend skype project yestreday, acutally i forgot. Ms.Buth told me that you had a great time. I hope to attend the next skype project. I listened to the three sound files of the recording. I’ve already sent one of them to Rita and trying to figure out how to post the other two files to the blog here. It’s an ELP file that is not supported by the programs I use. Anyway, I’ll try to find a way and if I don’t succeed I’ll email them to Rita, so that you could hear them at your c-lab. You need to download and install HardRecorder.com on your computers to be able to listen to those sound files. Laura and the other students, who couldn’t make it to our first skype session, can also enjoy listening to our skyped conversation. Hi people!! I couldn't go to class today, just when you chat altogether throught Skype. I bumped into Majo at university and she told me it was great. I read what Buth has written and I could see that you talked about many things including kuwaiti music, so I would like someone to tell me something about it to catch up with you. This message is to thank you all for meeting me live online at Skype. I’m so grateful to you and to your EFL instructor, Rita for your time, and effort participating in this skype project. I had a wonderful time with you. I liked and enjoyed all your questions, which were focused on the topic of our project, “Freedom & Future Dreams in Different Cultures”. I was also impressed that you were the first international students who asked me about Kuwaiti music. This was so flattering for me. I will try to find a short Kuwaiti song to post to the blog, here, so that you could hear it. BTW, I’m sorry if I talked too much but I was so happy and excited like I was talking to old friends, ( the interesting part was that we all managed to communicate very well in English. You were so clear and I understood everything you said. I really wish that we all meet face-to-face either here in Kuwait or in Rosario, Argentina. Thank you for your time and effort to join in our first voice-session at http://skype.com/ , and I look forward to meeting you all again there on Monday. Hi everyone!! I am another student and I really enjoy learning English with Rita. She is an excellent teacher that knows how to entretain us while learning. I am at secondary school because I am 17 years old and next year I will study law as Anita. I find English a way of learning a new culture and meeting new friends and I do like it. I would also like to speak other languages like French or Italian because I consider that they are important if you want to travel around the world and communicate. This blog is so useful to contact with people from different places and to have a nice relationship with them, first by chat and then, with the passing of time, meeting them in person and having the opportunity to have a friendship forever. Hi everybody!!!!!!!! Let me introduce myself ; my full name is Ana Julia but I don’t like it very much that people call me in this way , every time that someone calls me “Ana Julia” it reminds me to my mother……she calls me like that and is always scolding me …like mothers always do, so let’s just call me : “Ana”...is shorter and less serious!!!!! lol!!!!!!! I’m 19 years old and I’ve been studying English since I was 10 years of age……believe or not believe I study English as a hobby… I find in English a way to get out of my own world….!!!!!!! Can you understand what I mean? You may think I’m a bit crazy….and you’re right…lol!!!!!!! This year I started a new stage in my life: COLLEGE! I study Law…I love my career…I’ve wanted to study that since I were 7 and now I’m here learning all about that! It’s my vocation, I can fell that so I’m very happy !!!!!! Other thing about me is that I love the “Cyber World”, I spend and waste (both…) hours in the net trying to know a bit more about English and the World….that’s why I find this project very helpful for our English and also is an engaging way to get to know different things about our cultures!!!!!! I become interested very much in your government structure and all about the “Emir” (is something new for me….we don’t have this representative here , so I want to know all about that). Also, I’m curious in the way that your country is organized… How do you choose the “Emir” without politic parties? That’s another difference between our countries, here we have a democratic government and politic parities are essential, because through them citizens can get involve in the direction of the country! Well….Another approach to me is that in classes I’m of those students who are always making jokes and funny comments … once I start I can’t stop…lol!!! I’m always with a smile in my face because I’ve learnt that smiling is an enjoyable way to take pleasure in life . I ‘m myself a good laughing and I like sharing that with the people who love me! Well, that’s all from me right now…… I’m anxious to get any notice from you… Bye bye! It's so nice to see you all here, sharing views and interesting information ! Remember we are counting on YOU for this project...., so we'll be happy to read what you post and to listen to what you think ! 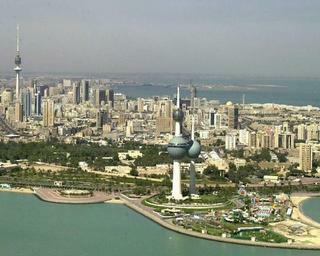 Hi, this is a view on Kuwait city (the capital). As you can see Kuwait towers are appearing clearly and am going to talk about them briefly. Kuwait Towers at the Arabian Gulf Road. Designed by a swedish architectural firm and opened in 1979 they have become the Kuwait's main landmark. The largest of the three towers rises to a height to 187 metres. The lower globe on the largest tower is used to store water in lower half and have a restaurant in upper half, and the smaller globe is rotating to view all Kuwait city. The single globe on the middle tower is used to store water only. The small tower with no globes is used to light up the other two. Hi! I'm Clara, one of Rita's students. I'm 18 years old, and at the moment I'm studying Accountancy in the university. Apart from university, I'm also studying english, a language which I've been studying for many years. I also like going to the gym... where I meet friends, have a good time, and get fit too. 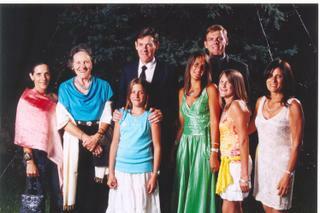 In the picture I posted I'm the one with the green dress. I think "Skype project" is a very appealing one, thow I'm not very keen on computers. It would be interesting to know how do you spend your time in Kuwait and what do you find appealing doing and what you don't like. Today's meeting was very succesful... we learn many things about Kuwait and their lifestyle. It was an interesting way to get to know how a different culture (though as we spoke with Buth, I notice we have lot of things in common). It was very nice "meeting" Buth. Hope to get news from you. Can you see Rosario in this map...? What do you know about our country...? 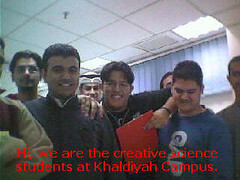 Hi, friends from Kuwait and Bahrain! 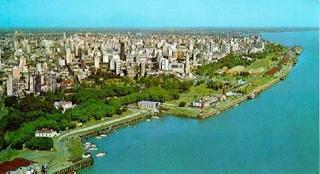 This is a view of Rosario, the 2nd biggest city in Argentina, by the river Parana. It has 1.000.000 inhabitants and we all speak Spanish. Hi! I' m another Rita's student and I'm very interested in knowing some things about your lifestyle and your country as we've read so may compelling things that cought my attention. How is a typical day in your life? Here in Argentina teenagers have an extremely active life... Most of us study another language (English is the most studied, but also Portugeses and French), is very common to play some sport (girls are very keen on voleyball or hockey, while boys -almost everyone- on FOOTBALL or rugby, but both sexes agree with the idea of going to a GYM), and of course we go either to the secondary school or the college. I hope we will get in touch very soon!! I'm delighted to meet you, Buth and Ali ! Our weekend starts right now, Friday evening, and this particular weekend is longer than the others because next Monday is a holiday. But on Tuesday we are coming back to school. What are your weekends like...? What do you enjoy doing ? Do you go out with friends? Can young people come back home late at night ? Is that dangerous? Look forward to your news ! Hi!!! I´m Poly, one of Rita´s students. I´m 21 years old and I´m studing Business Administration in the States University. I live in Rosario with all my family. I´ve been studying English for many years. I find this experience an exellent opportunity not only to learn more English, but also to get in touch with people from other places. I would like to know how teenagers live in different countries, which things they enjoy doing and which ones they hate. Also, I´m interested in knowing the difference between their culture and our own. I hope we all enjoy this experience!!! Hi!!! I'm Florencia Matteo and I'm really glad of having this oportunity... To start knowing each other I could say that I'm 17 and I'm still at Secondary School. I don't live in the city of Rosario, I live in a small town called General Lagos,but I travel three times a week to attend English classes. I'm finishing school in november and planning to study Economy in Rosario next year. It would be great if you could tell us something about you... For example, How do you spend your day? What do you do on weekends? It will be wonderful to know the different aspects of kuwaitis' life... Don't hesitate about asking whatever you want... Keep in touch!!! Hi!! I´m Mariana, one of Rita's students. I´m 20 years old and I´m studying International Relations at university. I hope this Skype project work out, it might be really interesting!. 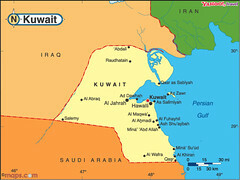 I´ve been doing some research about Kuwaitis as I didn´t know so much about you (shame on me!) and I finded out that, althoug I could read all the pages on the internet about Kuwait or other country, I know nothing compare to what you could tell us about your lifestyle!! or going there of course but it´s a little more difficult! I hope the same happens to you so you can find this project appealing. Welcome to this project, Buthaina and Ali !! We are looking forward to meeting you in this cybercorner, where we communicate and share beyond our clasroom door . We are very interested in knowing about you, about the Kuwait people, about your customs and your culture. And we are ready to share our own, to learn and interact together.